Our team visited Bispham-Endowed School in Blackpool last week talk about the Plymouth Road Bridge Replacement Project that we are currently working on, and as a result we have received some positive feedback from the school and Blackpool Council. 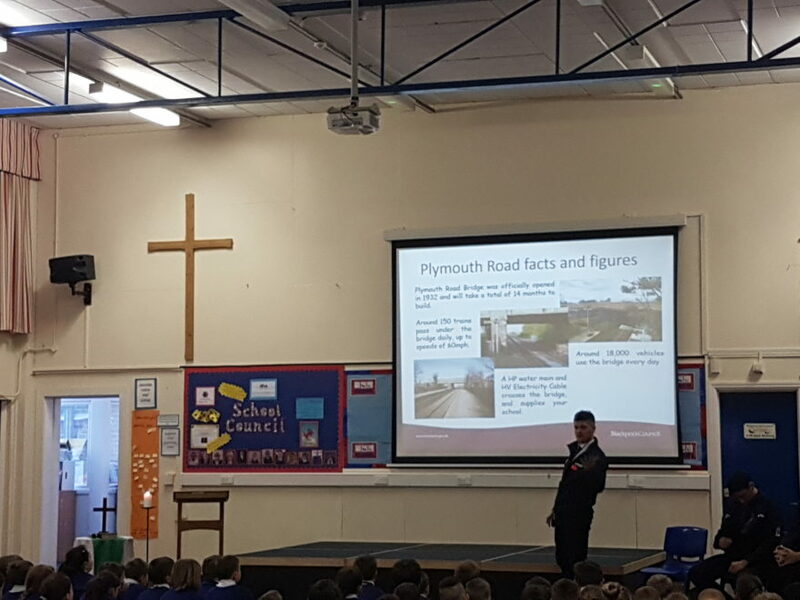 “We were very pleased to welcome the visitors from Story Contracting and Blackpool Council who came to talk to our junior aged children about the Plymouth Road Bridge Replacement Project. Andy Hogarth, from Story, gave an excellent presentation about the background of the project, the construction of the new bridge and how important health and safety is on a construction site. The children were very interested in all of Andy’s facts and figures, and enjoyed seeing the fantastic photographs and video clips. Listening to Andy talk about how he became a civil engineer, the children could really see the use of the subjects they study in school, such as mathematics, science, design & technology. From their comments afterwards some children have clearly been inspired to consider jobs and careers in the construction industry in the future. “Fred was extremely pleased with this morning’s event at Bispham Endowed School. It went very well, thanks for all your support”. Well done to everybody involved with the visit for making it a success and providing a positive experience for the school and their pupils.